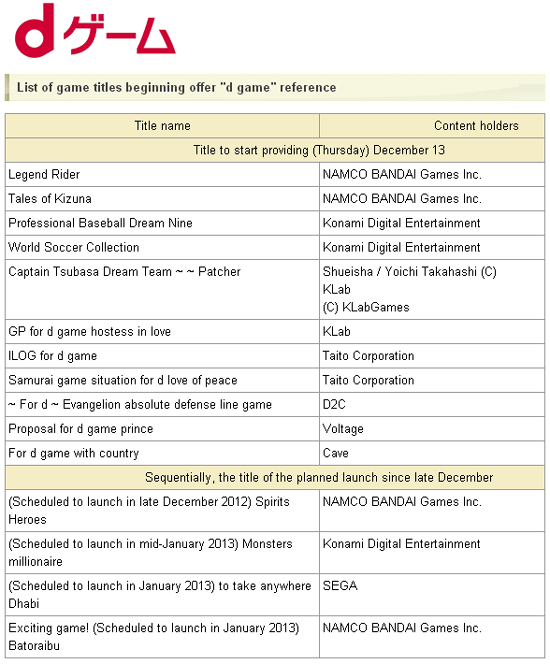 NTT DoCoMo, Inc. will offer “d game” services from December 13, 2012 in collaboration with our leading game companies. DoCoMo provides carefully selected, “d game” will provide a safe and secure while considering a good game. Beginning of Title 15 provides around the social game one will be provided to. Since then, we will continue to offer new and popular titles successively. Registration fee, the basic fee is free 2 by, for in-game content will be part of a fee. You can charge in advance “d coin paid content, TM ” three can be purchased in addition, can also be replaced with DoCoMo point. Because it corresponds to the “docomo Mobile Payment Charge” of the “d coin”, along with the pay monthly mobile phone bills of NTT DoCoMo. In addition, restrictions and limitations provided in such minor charges to users, we have also considered a safe and secure use of youth. In addition, “d game” because it can also be used in a non-DOCOMO mobile phone smartphone, to enjoy the game with us and many of our customers. In the future, not only in social games, as well as expanding the various games, we aim to expand globally in the future as well. DoCoMo, we will strive to achieve further enhancement of the “d” market in the future, feel free to enjoy a variety of content.